← Cedar Plank Salmon ROCKS! ..and OF COURSE I forgot to take pictures of the fish. I gotta tell you though, Jamie’s fish taco recipe was a STELLAR one. And I only made ONE SINGLE substitution (I swapped out the Agave for Honey). C nearly licked the bowl clean. FINE. I’ll admit it. I did too. So now I’m trying to figure out when I can go buy fish EN MASSE because I’m SO making this next time I buy fish. SO SO making this. OH! I served this with a Cabbage Slaw in a Lime-Mayo dressing and a Lime-based Guacamole. I had a lot of limes…. 2 Tablespoons Raw Agave Nectar **I subbed in Honey. 1 Tablespoon Onion Powder **Oh crap. I fibbed. I swapped TWO things: I used dried minced onion. Tortillas **I used 6 Flour Tortillas, warmed on baking sheet in the oven. Feel free to use what you like! 1- Add everything but the fish and tortillas in a ziploc and mush it together to mix everything together. Add in the fish and shove the bag in the fridge to marinate for up to 5 hours. 2- Saute fish AND marinade for about 5 minutes on low/medium heat until the fish is white and opaque all the way through. **C did this part. He mashed all the pieces up in the pan so everything would cook quicker. 3- Heat up your tortillas any way you please (don’t nuke – microwaving makes tortillas blechy). 4- Fill tortillas with fish, slaw and guac and SERVE! Nice balance of sweet and tart. 1″ of Jerusalem Artichoke, washed and cut into small chunks or strips **Totally optional. I love love these little things and buy them as often as I can find them! They taste like a mix of cucumber and coconut. Mild and nutty and crunchy. SO addictive! 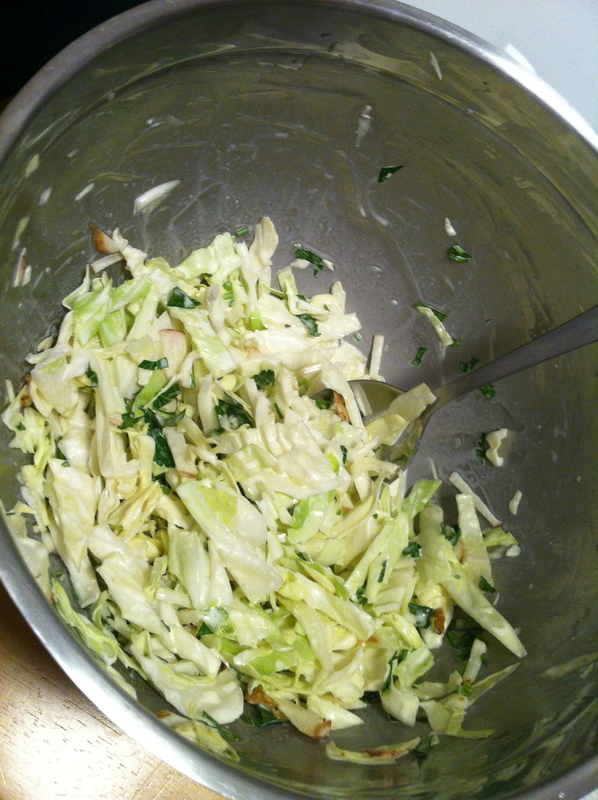 1/2 head of Cabbage, sliced thinly. **Tonight I used green. Red tends to be more traditional with fish, but I had green that needed to be used. YumYumYum! 1- In a medium sized bowl add the mayo, lime juice and zest and stir. 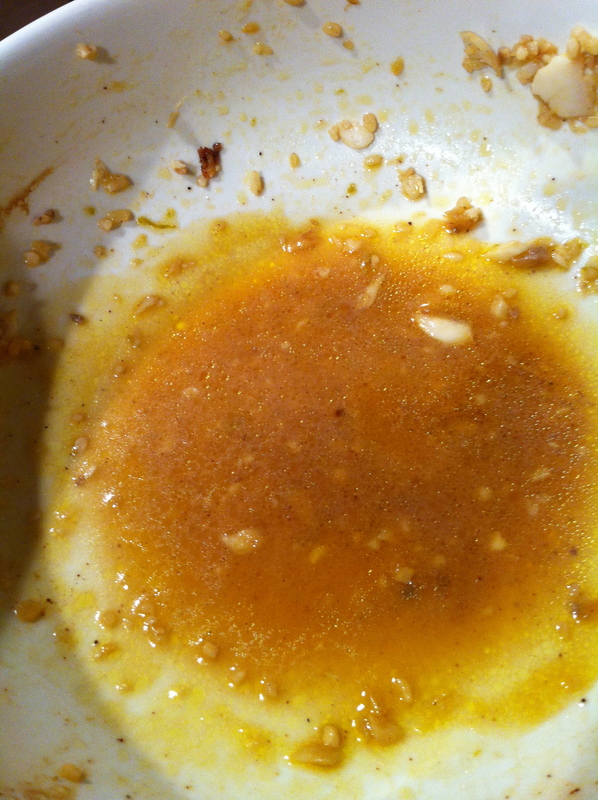 Mix in the honey 1 teaspoon at a time until you reach the best balance of tang and sweet. 2- Dump in the Jerusalem Artichokes & Cabbage and stir to combine. 3- If you have the time, let sit for 30 minutes, strain and then serve. Otherwise, just whack the bowl on the table. It’s mighty fine as is. …It was a teeny little avocado. 1 handful of Parsley **If you really like cilantro *shudder* you can totally sub that in. 1- With a sharp knife make a cut all the way around the avocado. Twist the halves apart to separate. Set the side without the pit down. Hold the 2d half with one hand and the sharp knife with the other. Hit the pit with the knife blade as if you were gonna try to cut through it. Your knife will sink into the pit. Twist the knife to help the pit release from the avocado flesh. Discard the pit. 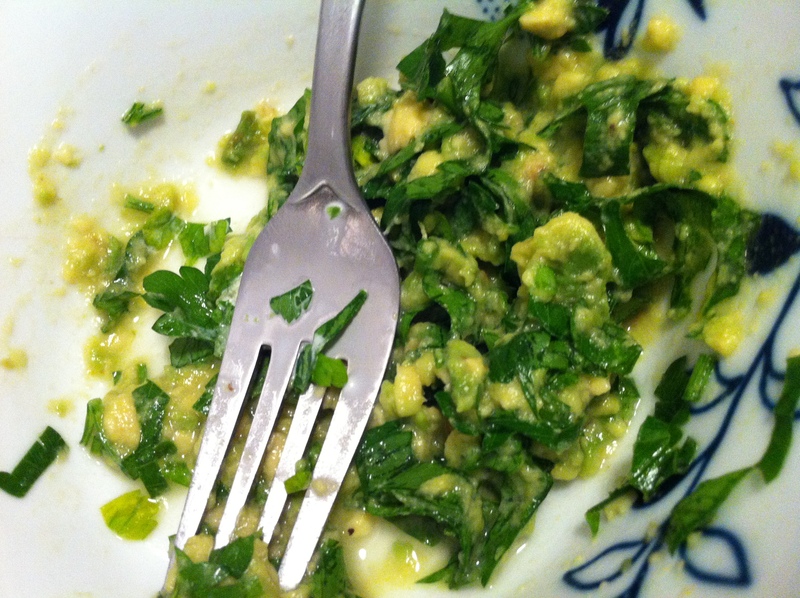 Using a spoon, scoop the green stuff outta the shell and into an awaiting bowl. 2- Add your zest and juice to the avocado. 3- Mash VERY lightly with a fork to break up the chunks and mix in the lime stuff. 4- Dump in the parsley and stir gently. Again, apologies for TOTALLY spacing to take photos of the fish tonight. 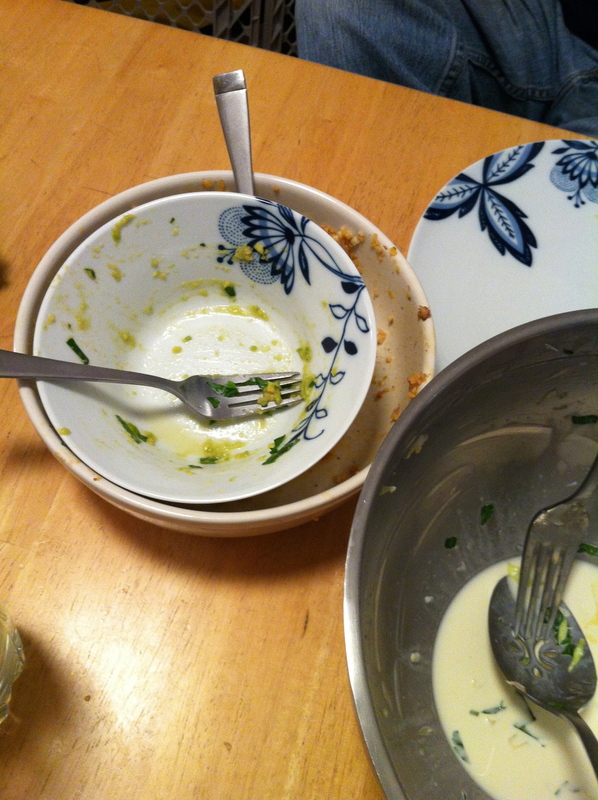 C said to take a photo of the empty bowl to show you how we DEVOURED everything. BTW – the babies opted for peanut butter on Ritz Crackers for dinner tonight. Along with blueberries (which are perfect missiles) and red pepper slices. Please add the number of servings with the recipes. And don’t forget the pictures! Oh and you might include pictures of the babies’ interesting meals, too.